We have thousands of properties for sale all over France. But we've no property for sale in Roscoff at the moment. And that's something we want to change. If you have a property to sell in Roscoff (or nearby) then act now to get a 50% discount. Just place your advert in the normal way (Click here to place your advert). Then send us an email quoting "Roscoff" and telling us that you you saw this offer. Roscoff, built from the natural grey granite of its region, is a port town with a delightfully traditional ambience. Built with the harbour at its very heart, and with its attractive streets and 16th century houses, it offers excellent facilities for both holiday makers and permanent residents. Its atmosphere is less frenetic than that of the larger port towns such as Calais and Le Havre, and it also benefits from a glorious setting on the beautiful north-west Breton coast. Roscoff has both fishing and pleasure ports, and these, together with the Rue Gambetta, form the heart and soul of Roscoff. It is here, around the old harbour that the most welcoming (if not, perhaps, the flashiest or most expensive) of the restaurants are found, and it is here that the ambience is at its best. Almost every town and village in France can lay claim to a lovely or interesting church, but Roscoff's Eglise Notre Dame de Croatz, with its Renaissance belfry and fascinating nautically themed sculptures, takes the biscuit in both fields. 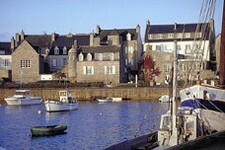 For leisure and pleasure, Roscoff is the place to be, as long as you enjoy life relatively quietly. It's lively, but not exactly rocking with nightclubs or heaving with city slickers. There are, however, some excellent restaurants offering a wide range of cuisines, and plenty of good shops too, with the ubiquitous hypermarkets of Géant and Champion just on the outskirts for all your supplies, and also for the essential take home bottles of wine before you get on the ferry. For those outdoor pursuits, Roscoff offers some of the most beautiful beaches in Brittany... and that's saying something in a land known for its beautiful beaches! Roscoff is famed too for its exotic gardens, which bring a welcome splash of colour amongst all the grey granite of the buildings of the town. Around and about too, you can access golf, horse-riding, cycling and some of the best walking trails in Europe. You can take a flight to Brest, with either Ryanair or flybe. If you aren't keen on taking to the skies, the ferry to Roscoff is a perfect alternative with Brittany Ferries, and you have the advantage of arriving exactly at your destination. There's also a train station in the town, if you happen to be travelling by rail. Brittany has always been popular, and property in Roscoff, being a seaside town, tends to be more expensive than property that is set further inland. However, there are bargains to be found if you keep your eyes open, and Finistère does tend to offer lower priced properties than other Breton departments. Do you know Roscoff better than we do? Do you have photos of Roscoff? Roscoff is located in the north-west of Brittany, in the north of the Finistère department. Access: By air: Fly to Brest with flybe or Ryanair. By boat: Travel by ferry to Roscoff with Brittany Ferries from Plymouth. Economy: The economy derives from a mixture of tourism, based on the port and also seaside tourism, and commerce. There is a fishing port as well as shellfish beds close to Roscoff. Interesting fact: Onion Johnnies originally came from Roscoff. These are the traditional French onion sellers, with their berets and bicycles, who carry the onions around their necks.